Ever sit around and wonder where all the members of the True West staff matriculated from and what exactly made them want to be a part of the history biz and hang with the True West gang? 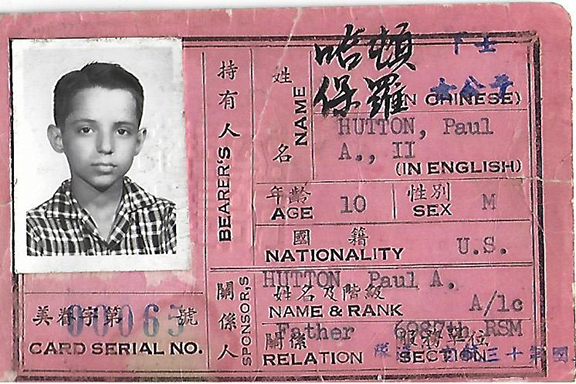 "This military dependent ID card was made in July 1960 when my Air Force family was transferred to Taipei, Taiwan. I was a very unhappy ten year old. I had loved our four years in San Angelo, Texas, where I had fallen in love with tales of Davy Crockett and the Alamo that I learned in school. From those days grew my obsession with western history. When we returned to the states in 1963 I bought my very first issue of True West magazine at a local drugstore for 35 cents. That was a fortune to me back then but the colorful Paxson painting of Custer's Last Stand on the cover of the October 1963 issue enthralled me. I hardly ever missed an issue after that.I remember when the magazine's historical consultant, Dr. Walter Prescott Webb, was killed in a car accident. I did not know who he was back then but I sensed from the obituary in the magazine that he was really important. Later I learned that he was one of our nations greatest historians. Many years later I asked my friend Bob Boze Bell, now the owner and publisher of True West, to assign me to the same position once held by Dr. Webb. He did and that is why I am listed as"historical consultant" on the magazine's editorial credits. So very cool, Paul Andrew Hutton!